Your Account Management Panel (AMP) is used to register domains, access cPanel, update your billing information, and more. All web hosting accounts include your own AMP, however you must set up your AMP account login by visiting the link in your "Welcome to InMotion Hosting" email. 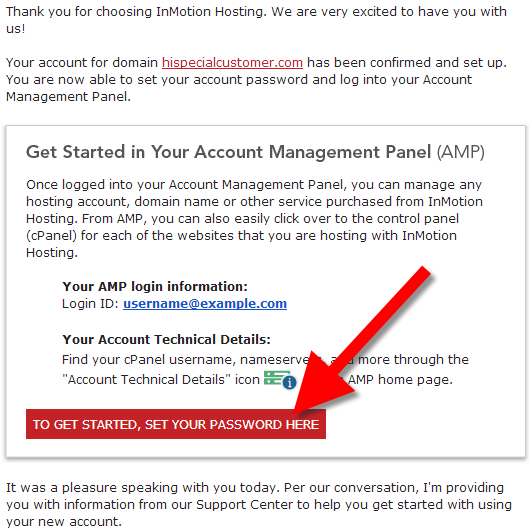 When you initially receive your "Welcome to InMotion Hosting" email, there is a button inside the mail that takes you to the AMP login set up. Click the To Get Started, Set Your Passsword Here button in the email. More information on this can be found at the following link. Once you have set your new password you can click on the "login" link and log into the AMP with your email address and password. The steps below explain this. Click the Amp Login button at the top right side of the page. You will be redirected to our Login page. If you enter an e-mail address and password that only match one account: you are automatically logged into that account. If you enter an e-mail address and password that match multiple accounts: each account is displayed as a link. Upon clicking you will be automatically logged into that specific account. If you get logged into the incorrect account: the e-mail/password combo is not correct for the account you are looking for. That is it! Once your username and password are processed you will be in AMP. You should see the AMP home page like the snapshot to the right. Note! If you forgot your password you can reset it by following the steps of our article on resetting your AMP password. If for whatever reason your password reset does not work, please contact tech support and we can look to see why. I'm locked out of my account, how do I regain access? I have twho hosting plans, How to Create a separate AMP access for each ? Unfortunately, this is not a capability built into AMP. However, you can reach out to our Customer Service team to request that to be done with your hosting plans. You're welcome. We're are always happy to help! Here is a link to our guide on How to install WordPress using Softaculous. I recommend contacting your server administrators for assistance as they may be experiencing server or email issues. Also, their security policy may automatically rotate passwords when it detects issues such as a compromised account. I have C-panel login Details but i dont have AMP login details How can i upgrade my hosting package? and how can i get the AMP login details? Any hosting plan with us should include an Account Management Panel (AMP). You can reset your AMP password via email at any time. If your problems persist, I recommend contacting Live Support so they can provide account-specific assistance. I get locked out of In Motion Hosting's AMP and CPanel every time! I cannot check my email either (lora@lkaisler.com). I want to cancel my account and take my URL (lkaisler.com) to another service. How can I do that, when I cannot get into my account? This is absolutely the most frustrating service I have ever tried to use! If you have gotten locked out of your cPanel and AMP you can contact technical support and they should be able to help you reset your password or unblock your account if you were blocked from cPanel. Can I set up a second AMP access? I have my client for whom I've been hosting at my servers, but just set up this one for them. I will be doing much of the management, but they may need (or want) access too. Can I authorize a second person or do I have to reliquish my access information ?? If the third party is going to be limited to development, you can provide them with cPanel access. This means they will have all the tools necessary to work on the technical side and need not have any access to the billing details and other information available in AMP. How do I get into cPanel from AMP. I keep being directed to a screen that times out. 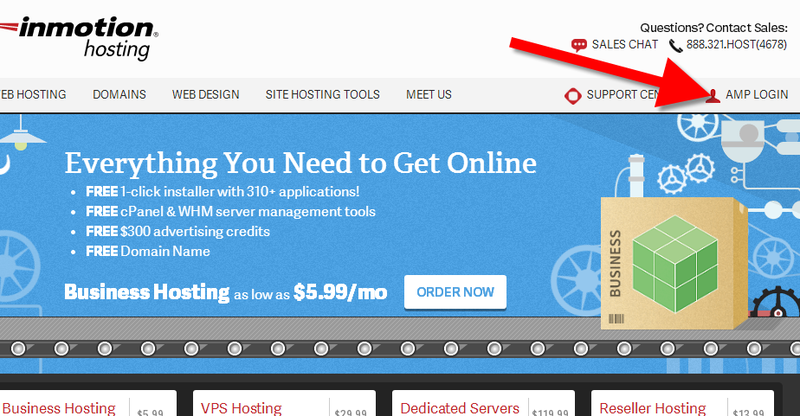 Clicking the cPanel button should take you there. If not, there may be a misconfiguration with your account. You will need to contact Live Support if that is the case so they can look into your specific issue. hello, how do you change the amp username. it referes to an old domain, and now i need to update it to the new one. You can't change it yourself. You would need to submit a verified support ticket requesting the change. Typically, it's not able to be changed, but if you have changed your primary domain, then may be able to change it for you. RE: Dedicated Server Account Move Complete - nedcoe5 - InMotion Hosting, Inc. Please note that this will result in no downtime for your site as we will leave your account active on the old server for 24 hours to allow for propagation. Please leave the old server (205.134.238.34) up for the time being otherwise energyavenue.com is to not going to work at all this weekend. There is no way the new server is going to work as it is right now there are a lot of custom linux files missing. Plus the orders received today are not in the db on the new server. We will notify you when we no longer need the old server after we switch the dns at godaddy next week. You will need to contact our support department to have this completed as this will require some account verification. my website is down,I can not open my website. Thank you for contacting us. We are happy to help you troubleshoot your site, but will need some additional information. What happens when you attempt to access your site? Do you get an error? Since joining you guys I have ran in to a couple of issues. I have whm reseller account and when accessing customer cpanel accounts via cpanel i get error. I have also got 3 sites on my whm server and these are sometimes producing timeout errors. Browsers- Chrome, internet explorer and Fire Fox developer’s edition. Time outs occur also when pinging website. I also notice the server is slower than my previous supplier, they did not have SSD drives. I also notice the SWAP is 100% and is on critical status, this has happened to me before with other supplier and produced slow server. This appears to be an account specific situation. You will want to contact our Live Support and have them take a look at your specific settings. I currently have 2 AMP Log ins (by accident) one is for my domain and the other has my DNS hosting on it - can I combine these? I'm trying to update my DNS settings also. Yes, the accounts can be combined. Simply call into Customer Service and they can take care of that for you very quickly. how to register to Inmotion hosting ?? already many times I tried but could not get in! If you're trying to register into the Support Center website, then this link will take you through the registration. If you're having problems still - please provide the registration name you're using so we can investigate. If you're referring to a specific account on InMotion, you need to contact support or customer service to create an account with InMotion Hosting. The subscription creates an Account Management Panel (AMP) account. hi, i am trying to read my emails using java application but my output is java.net.UnknownHostException... wat shall i do to run my project successfully to read the emails of my webmail using java. please help me. This generally goes beyond what we can help with but what is the full error you are getting with your application? I want to use the unique class C every vps. Thank you for contacting us. I recommend submitting a ticket request to our Support Team, so they can review your account, and determine if this configuration is possible. I was not able to locate the above link so I can submit a vified ticket after loging in. No such a thing!! I could not submit a virified ticket! Thank you for contacting us. Sorry to hear you are having trouble submitting a verified ticket. I logged into your AMP and verified there is a "Get Support" link on the very top right of the page. We are happy to help you troubleshoot the issue, but will need some additional information. What type of browser, and computer are you using? For example are you using Chrome Browser on a Windows 7 computer? If your problems persist, I recommend contacting Live Support, so they can replicate the error. I have an accoount - paid, trying to get the site looking nice, build it and in the control panel/ in my amp and all that: NO PREMIUM WEBSITE BUILDER.... all these scripts and apps and database info I don't care about... I see Wordpress, but don't want to use it as a builder... maybe I should. I used to have an account and I DID NOT HAVE TO LOAD..... A web builder. So aggravated... should be RIGHT there obvious. Thank you for your question. You can Add the Premium Web Builder from AMP (Account Management Panel). It is really a preference how you want to design/build your website. We offer the popular options that are in-line with the industry, including WordPress, Joomla, Drupal. These are just a few of over 150 Software options you can use. You have an apartment. Your hosting provider is the apartment landlord. WE provide the space to host your website (just like a landlord provides space for you to live in). The landlord provides basic amenities like water, and electricity but its up to you to use it appropriately. Same with us as your hosting provider, we provide many amenities like WordPress or BoldGrid, but its up to you to use it accordingly. Just like your apartment complex my have an interface or website so you can pay your monthly mortgage, we have AMP (Account Management Panel). This is where you can see your "lease" with us and pay your bill. This is also where you can upgrade your account. Let's say your website grows, just like your family in the apartment may grow. You may need more space or even more amenities. So if you're currently in an apartment which would be like shared hosting, you can upgrade to something like a condo (VPS) or a dedicated server (single family home). We're still the landlord, but it's up to you to manage it. I hope this analogy helps! Let us know if you need anything else. 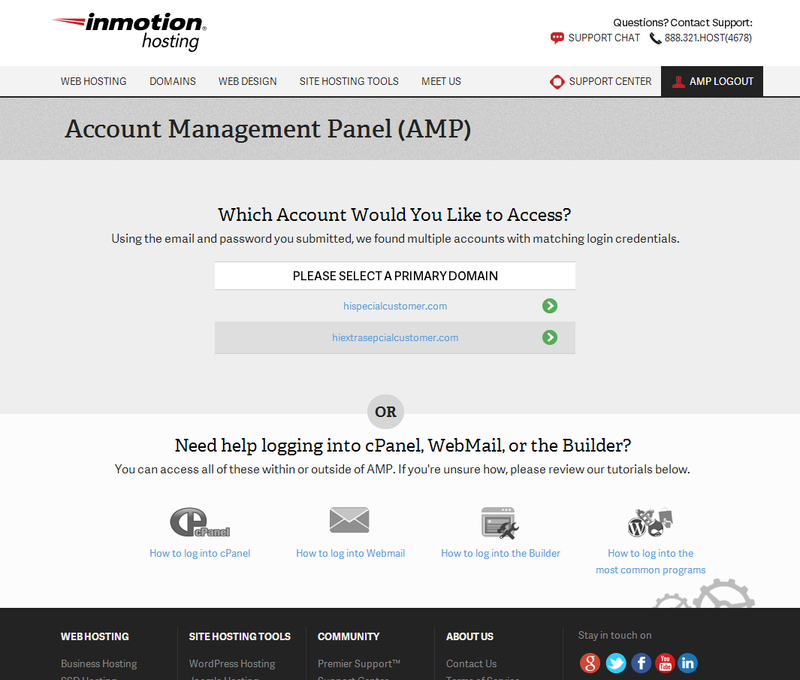 The AMP (Account Management Panel) is a proprietary tool created by and for InMotion Hosting, so other hosting companies do not have this particular application. You can <a href="http://www.inmotionhosting.com/support/edu/cpanel/getting-started-cpanel/how-to-log-into-cpanel#access-via-amp">login to cPanel</a> right from your Account Management Panel( AMP ). How to add another email account to the AMP login? Your AMP is connected to a single email account. You cannot add another email account to it. You can change the existing one if you like, however. If you have forgotten your password for AMP, you can reset it with these steps. Unfortunately we have no information within this comment to help your situation. It is likely best to contact the Live Support team so you can give identifying information to them. They will be able to take a look for your specific account. If you wish to update your credit card information, please follow the directions on our article on updating your credit card via the Account Management Panel. Server's take when secure1.inmotionhosting.com a lot of time to respond. The site may be temporarily turned off or too busy. Try again after several minutes. If you are unable to load any pages, check the computer's network connection. If your computer is protected by a firewall or proxy, make sure to allow Firefox access to the Web. Luminous tutorial here! Actually I first learn that information how to log into AMP. Really it is crucial and beneficial though I would sure print out the page for my use. Thanks!